Inside the Pass where the Gulf meets the Bay, the water changes greatly in color, depth and current strength. On this particular day the beautiful, clear green waters of the Gulf greeted me as I walked the point of the Island. In view is the historic lighthouse, which guides boats in from the Gulf to the bay. 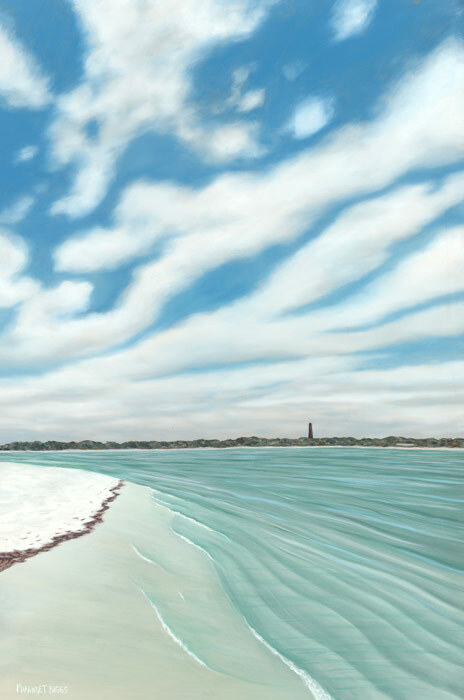 The composition is such that it pulls the viewer in from the bottom of the piece where they stand up to the bend in the shoreline and around to the very tip of the Island and the Gulf of Mexico.